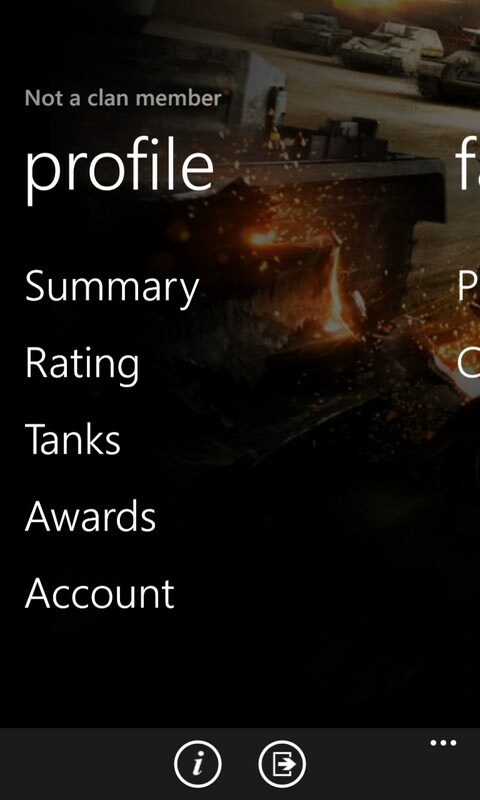 World of Tanks Assistant – Soft for Windows Phone 2018 – Free download. World of Tanks Assistant – Official client of World of Tanks from Wargaming. 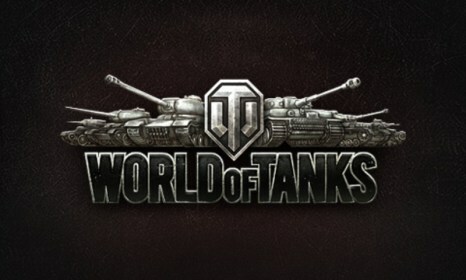 World of Tanks Assistant is an official application from Wargaming allowing players of a very popular worldwide game to have on hand the latest information regarding news in the World of Tanks and personal achievements on the battlefields. The program works fine with Russian, American and European servers. To log in the program you have to enter the personal details of your account (e-mail address + password of the account). You don't need to worry about the security of data for the application developers are the creators of the game itself, not some enthusiasts. 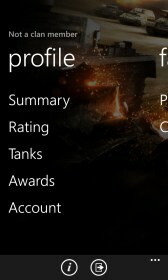 Once in your profile, you will find sections named "Summary", "Rating", "Tanks", "Awards" and "Account". Having entered some section, you can move to the others by conventional right or left gesture. 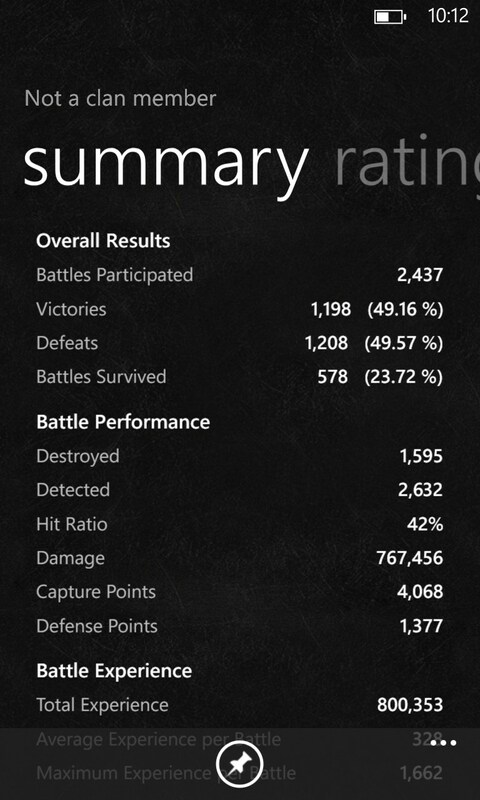 So, in the Summary section you will be able to review your results on fights: victories, defeats and survivals in percentage and quantitative ratio. There will be also marked your battle performance and experience. 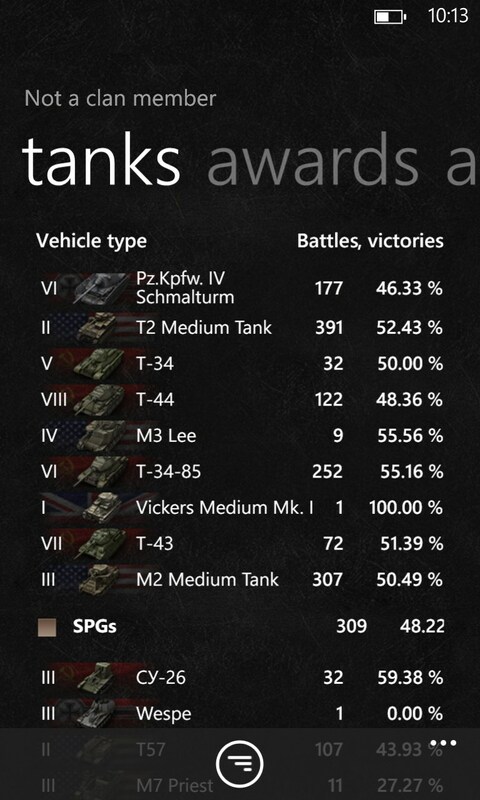 The section called "Rating" speaks for itself and has information on all of your accomplishments since the first time you run the game, or register at the Wargaming online. 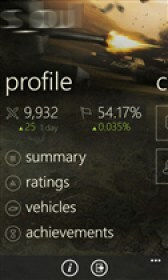 In the section "Tanks" you can get full information about the tanks that you owned through all the time of attendance in the fighting. In truth, many would like to see in this section a list containing only the vehicles available in the hangar at the moment with the possibility of the return of statistics if you purchased a new tank that you had already had but managed to sell earlier. And yet on this page the entire list of equipment that has ever stood in your hangar is presented. 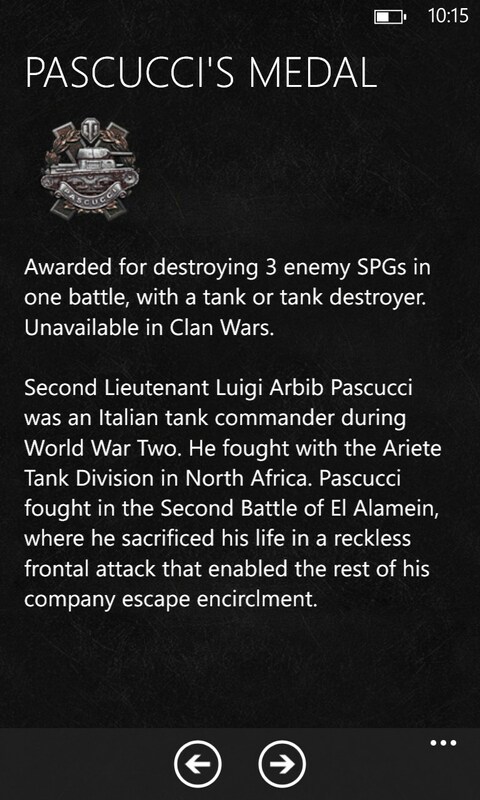 In the "Awards" section you can see what you achieved on the battlefield so far in the game. 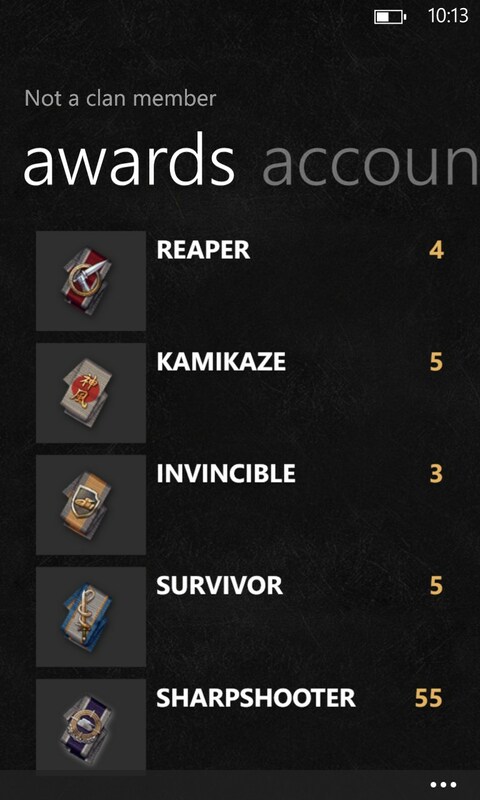 Click on a specific award, and you will see the achievements for which it was given. 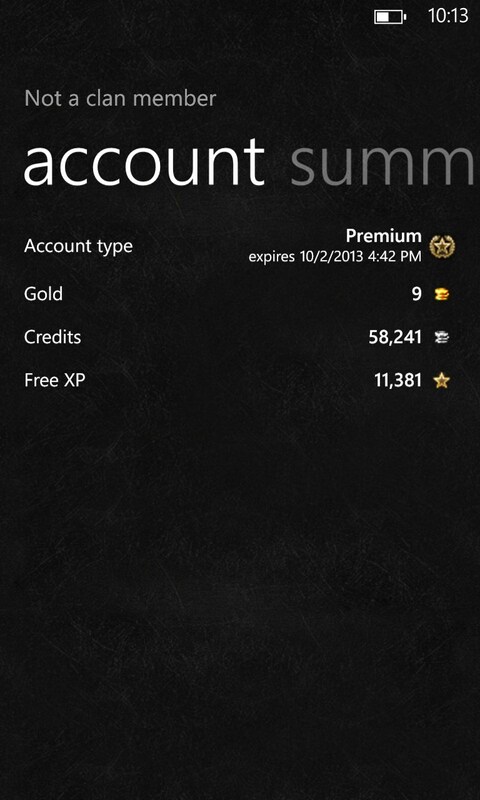 Under the "Account" section you can look through the current status of your account in terms of the number of credits, gold and free experience, as well as find out when a premium account comes to an end in case if it is actived. By the way, the page with the overall results of your activities can be displayed on the main screen in the form of a tile, and then this information will always be before your very eyes. And of course, you have the opportunity to share your achievements with friends by sending data to a page at the social networks like Twitter, Facebook, VKontakte (VK) and Odnoklassniki (Classmates). NavigationNavigating the program is very simple and convenient. If you're at your profile, a swipe to the left will take you to your favorites where you can pass over to the players, added friends, or clans which you are a member of. Another swipe to the left takes you to the news page where you can find out more about all the novelties, matches and the ongoing specials. We still have statistics on the last days and weeks with the markings of growth or decrease of your efficiency displayed in the application to wait. 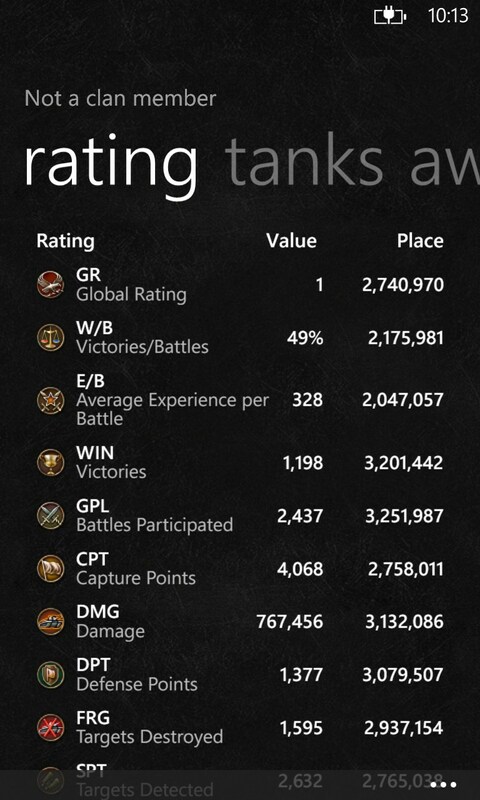 As for the rest, the program is very useful that will appeal to all fans of the World of Tanks.